UMass Extension has been spreading the gospel of integrated pest management (IPM) since its inception in the 1970’s. For almost a decade, UMass has been building on that history developing a robust platform for working with farmers as mentors in IPM. Starting in 2008, UMass vegetable and fruit extension educators received three consecutive plant pest management grants (each of them for three years) from the United States Department of Agriculture’s (USDA) National Institute of Food and Agriculture (NIFA) to provide IPM implementation. NIFA provides leadership and funding for programs that advance agriculture-related sciences. 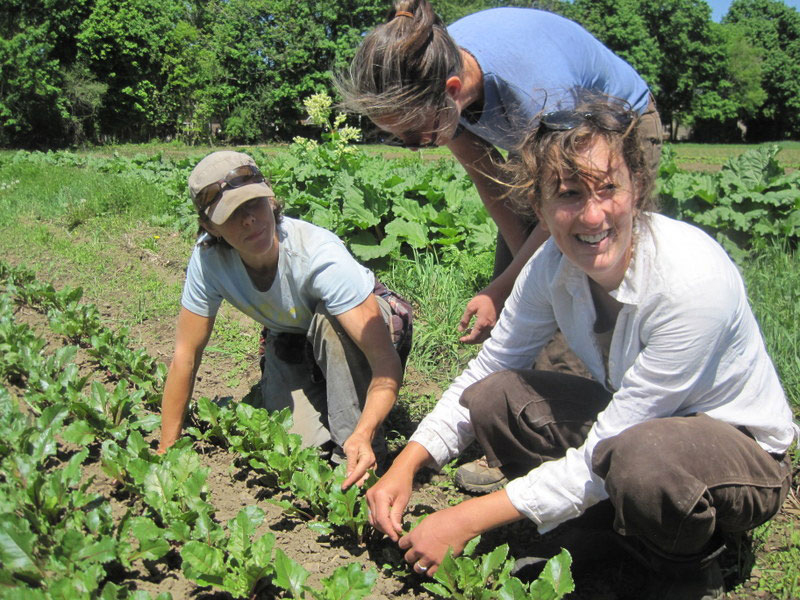 With the grants in hand, the question became ’how does a university stretch ever-thinning resources even wider?’ The UMass Extension Fruit and Vegetable teams’ creative solution was to work more directly with farmers as ‘Mentors’ and ‘Partners’. Nine years into it, so far, so good. Delivery of information and best practices about IPM is becoming deeply-rooted from the Berkshires to Cape Cod and the Pioneer Valley to the North Shore. 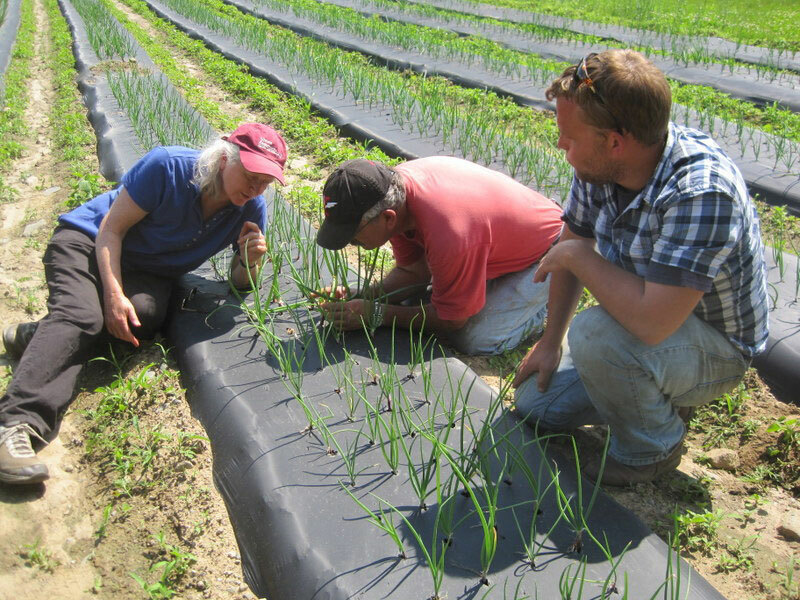 Here is how it works: UMass Extension professionals work with nine to ten mentor farms each year during the growing season. These farms commit to working with Extension for 1-3 seasons to solve their most challenging crop and pest management issues and to share what they learn with employees, apprentices, and their farming communities. First, growers choose their top 3-5 specific IPM goals and work with Extension experts to come up with new, science-based strategies to implement over the growing season. For example, one farmer struggled for years losing 50-60% of his spring brassica crop to cabbage root maggot because he couldn’t predict when the maggot would arrive each spring. His goal was to reduce losses to cabbage root maggots. Working with UMass he began using sticky cards to monitor the arrival of the adult root maggot flies, and compared his field observations to a pest forecasting model. 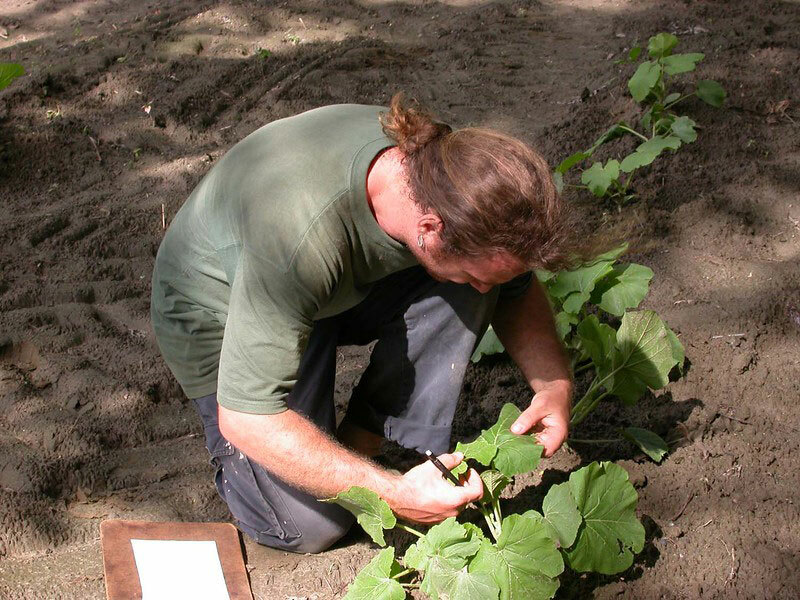 He is now able to row cover his crops before the flies lay eggs and protect his spring brassicas. After growers develop an IPM plan, they meet individually with Extension staff every two weeks for one or two hours to receive individual training. At the end of the season, techniques and success are evaluated and Extension staff provide direction about what, if anything, can be further improved. Mentor farmers may also host a field walk or twilight meeting on their farm so other area growers can learn more about IPM techniques, thus extending the education further. 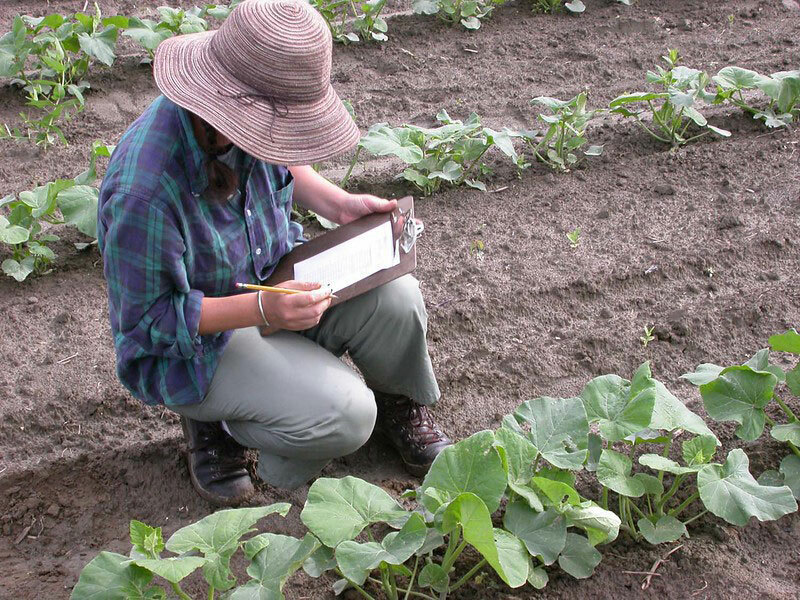 Scouting results from Mentor farms are used in preparing Pest Alerts for Vegetable Notes on a weekly basis, extending timely information to over 2,500 growers all over New England. The grant funding also allows participating farms to receive two soil or tissue tests with consultation on interpretation and further recommendations and up to four disease diagnostic tests performed by the UMass Plant Diagnostic Laboratory. Insect-trapping, baiting equipment and hot seed treatment may be provided, if needed. Voices of experience: from Mentor Farmers. Jessy Gill, Program Director for Flats Mentor Farm, clearly loves working with immigrant farmers. This Lancaster farm, begun in 1985, is rooted in the needs of beginning immigrant and refugee farmers who have settled in Massachusetts. They are highly motivated to produce specialty crops which embody their culture. At this time, farmers from Fitchburg, Leominster, and Providence, R.I. among other cities and towns, come to Lancaster to grow their food. Collectively, 250 farmers hail from 15 countries. This cultural diversity creates some unique challenges in teaching farmers IPM methods since there are so many little-known crops growing side-by-side, and so many different languages spoken. For this reason, they were very interested in becoming a Mentor Farm. UMass extension educator Sue Scheufele has developed photo-based pest identification and management tools to help explain IPM techniques. Jessy relays that this method has been very helpful to the Flats farmers. While the Mentor Farm program takes a whole-farm approach to working on IPM, UMass also develops Partnerships to work on specific trials with some farms. These farms assist UMass with targeted research or demonstration projects. Extension staff provide farm visits, support designing and implementing the study, and assist with data collection and analysis. Further, Extension staff provide direct in-person consultation with a member of the UMass fruit or vegetable extension team on a regular basis, a written summary of the research project and findings, and some supplies or other research materials that might be needed. A recent example of a Partner Farm collaboration was a study with Red Fire Farm in Granby that examined the use of mustard as a biofumigant for parasitic nematode control. In this field study, they found that biofumigation reduced the nematode population enough that it would be safe to grow potatoes there, but carrots needed even more reduction than was possible with this method. Members of the UMass Extension Vegetable and Fruit Programs, discovered they are able to dig deeper and teach the practice of IPM when they spend more time with fewer growers. McKeag says, “Because these skilled farmers then reach out to train others, the hands-on work of extension is multiplied throughout the state. They have demonstrated they understand IPM methods and deliver on the promise to reach out beyond their farms.” This innovative way to share information has helped to cast the net wider and teach more growers about IPM with limited resources. Arthur Tuttle, member of the UMass Extension Fruit Program, shared his observation, “This program requires a lot from the growers to meet with us every two weeks, but we are finding these people really engaged in the process. Many are making a real splash in their communities as leaders in IPM techniques.” Reviewing records from nine 2016 Mentor Farms, 88 problems were identified resulting in 275 recommendations being made. Those numbers signify substantial progress. Extension fruit and vegetable educators divide mentor farms among them to ensure good coverage around the state. Additional team members who cover the state with on-site visits include Jon Clements, Sonia Schloemann, Hilary Sandler, Katie Campbell-Nelson, Katie Ghantous and Liz Garofalo. Working together across commodities allows extension educators to learn more about challenges faced by diverse growers throughout the state, who often manage fruits, vegetables and even cranberries on the same farm.